Hi Emily, you can make your own homemade cheese, a very simple variety. Here’s a detailed description of the process. A key factor in natural cheese is its selective concentration of the insoluble components of milk. Heat, acid, salt and bacteria both jointly and singly play effective roles in transferring the concentrate into an acceptable, fresh food of predictable quality, or later in conjunction with other micro-organisms and enzymes, into a cured food. Natural cheese can be classified into groups according to its moisture content, age, type of ripening agents or the rheological qualities of the cheese. For example, classification of natural cheese based on moisture is divided into four groups, very high H2O (cottage cheese), high H2O (Mozzarella cheese), medium H2O (Cheddar cheese), and low H2O (Parmesan cheese). The moisture levels range from 80% to 13%. The following seven steps are used for most of the 18 distinct variables of natural cheese making. The first step in basic cheese making is to prepare warm milk with starter and rennet extract or paste, causing the milk to curd into a block. This curd may either be set with starter only, causing an acid iso-electric casein, or a sweeter, calcium paracasein curd, set with both starter and rennet extract. The sweeter curd will materialise in only 15 to 30 minutes at about 32 degrees Celsius however, the acid iso-electric casein curd will take approximately 5 to 16 hours to curd at a given temperature. The optimum pasteurised temperature is 161.6 degrees F (72 degrees Celsius) for 16 seconds only. Pasteurised milk is used for fresh cheese, however raw, heated or pasteurised milk may be set for ripened cheese. The rennin extract is added to the milk, causing the milk curd, however vibrations may cause a non-homogeneous curd. A milk container protecting against light is necessary because rennin is unstable to light. Also, it is inactivated at normal pasteurisation temperatures and is most stable at pH 4.0. The horizontal-wire knife is initially used to cut the curd into strips using a swing-gate motion. It is only used to cut in one direction, lengthwise. The vertical-wire knife is then placed in the curd and moved in two directions, the long and cross directions. Cutting the curd increases the surface area of the curd. Cooking the curd is generally defined as: heating the curd and whey for a specific time, while agitating. This process may be accomplished by using direct steam, jacketed water, or radio-frequency. Cooking the curd serves many purposes such as contracting the curd particles, driving out the free whey, and increasing lactic acid production. This suppresses spoilage micro-organisms, and influences the final cheese moisture. Separating the whey from the curds is accomplished by using a metal strainer or a sieve. Draining time will vary from 15 to 60 minutes, depending on the vat size. The whey acidity determines when to begin draining. This process also allows more time for lactic acid production. 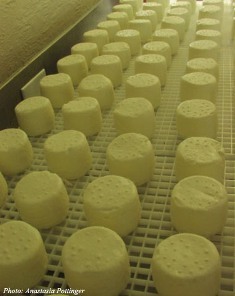 The type of cheese being processed and it’s texture will determine the time period of this application. During this time, lactic acid is accumulated causing the curd to change chemically and provide the correct moisture content. This will also allow microbial constituency for curing. The purpose of salting the cheese is to improve its flavour, texture and appearance and to suppress the growth of spoilage micro-organisms. When and how much salt is added is dependent on the type of cheese being processed. This processes gives the cheese its characteristic shape, texture, and extrudes free whey. The cheese is placed in a metal or wooden vat, usually with some type of weight placed on it to cause pressure. The standard equipment used is the horizontal, hydraulic, pressure plate type presses. Adjusting the specifications of the previous steps will cause different varieties of cheese.